Which would you rather have come to your hospital room: a doctor you’ve never met before, or a robot that lets you interact with your personal physician? 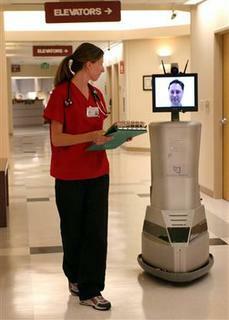 A new study indicates that many patients would prefer the robot they know to the human they don’t know. The study, conducted by researchers at Johns Hopkins University and presented Saturday at the American Urological Association's annual meeting in San Francisco, focused on how patients reacted to a "rounding robot." Fifteen of the mobile robo-docs, manufactured by California-based InTouch Health, have been placed in hospitals and nursing homes nationwide.